I've always had problems with tree roots in the sewer line from the house to the street. It's been at least 18 years ago when we added the clean out in the front so the plumber didn't have to drag his machine into the basement to rod out the line. At the time we did that, it would have cost a good $5,000 to replace the line from the clean out to where it joins the city sewer because the junction is in the middle of the street. It would have meant a permitting process to dig up and replace the street. Plus, my line enters the sewer at what would be considered 10:00 and that kind of attachment is prone to have problems with stuff getting hung up and blocking my line as well as stuff from my line not going into the city line straight. Back in mid-January, I noticed water on the basement floor. I figured it was getting to be about time to clear the line. Roughly every 14-18 months, I'd have the plumber come out and clear the line. It was still cheaper than the replacement as it will take a lot of years of rodding to equal $5,000. I figured after I got my tax money, I would have it done. The line stopped draining last Monday. My tax refund came the previous Friday. Good timing. Now, about the plumber. I have used one guy for the last 18-odd years. 14 months ago, when I last had the line rodded, he charged me $325 for what amounted to 15 minutes. I knew a guy who did plumbing for a living in Indiana and he said I'd gotten taken. "It should only cost, at the most, $70 to open a line. Anything more is a rip off." So, I have been watching for these coupon booklets I occasionally get in the mail. One happened to come last week. Leafing through it, I found a company that will rod out the line for $50. I called and they sent a guy out on Wednesday afternoon. For $50, he opened the line but that's not really going to solve the problem. If I had $10,000, I could completely replace the line from the house to the street with a seamless pipe that would handle things once and for all, but that's not an option. What he discovered is that the line really hadn't been cleaned out to it's full diameter of 6 inches. He had opened it to 3 inches but that was slow going. It seems my former plumber just stuck a 1 inch rodder in and chewed the line open enough to get the water flowing. No wonder his guarantee was 3 months. For $300, he would open the line up completely and give me a one year guarantee. That seemed like a very good deal. It took him 2 hours to do this. He said it seemed as if the line had never been fully cleared back to the house. When he did it, when he got to the junction of the interior and exterior lines, which are just outside the basement wall, I knew it. I know ground vibrations and these were vibrations. Scared the cats. But, it is completely done. Now comes the maintenance. Because it's just me, I'm not sending enough volume of water through the line to flush out the debris that accumulates. Once a week, I should do a completely full load of wash or run the washing machine on a full cycle even if I don't have enough clothes to do it. I also need to fill up the tub and let it drain. Doing those will keep the line clear. I should have them out once a year for the $50 rodding, of course I should, but maybe $50 is a small price to pay for not having sewage in the basement. 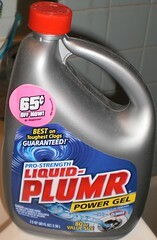 He also told me to stop using Liquid Plumr on my slow drains. If you have had a plumber come to your house, you may have heard this. These acids slowly eat away at your pipes and cause failure over time. I always keep a bottle in the bathroom. The shower and sink drains can start to run slow and my ability to use a snake to dislodge a clog is zero. I have tried but I cannot get the snake through the "U" joint. I hear you, plumbers. I acknowledge what you say and it makes sense. BUT, I am not paying you $150 for 5 minutes of work with a snake to free a clog when 3 ounces of Liquid Plumr when the drain starts running slow will keep it clear for 6 months. Sorry. I have a feeling that the more flushing of the lines that I do, will help keep the bathroom and kitchen lines clear without the need to use this. Today, I have washed 2 rugs and a pile of bedding that were on the floor in the water. I also did a full load of pants. I look at the loads I have yet to do and I'll be all caught up with my wash by Wednesday. I guess I'll need to write myself a note to "flush lines" about mid-month. Now comes the clean up. I have to stop by the store tomorrow and buy two big bottles of bleach to disinfect the floor. You know, it was a bit up front for me; thank goodness for the tax refund. But I feel more secure having had this done.